Moroccan bedroom designs can incorporate expensive furnishings, but if you're on a budget you can still achieve a Moroccan look with inexpensive accessories and bedding sets. You don't have to travel across the world to capture the feel of a country. Tuscan kitchens and Spanish living rooms are often recreated in North America, and most of these recreations are done by people who have never traveled overseas. If you dream of creating a boudoir that echoes the feeling of a Moroccan haven, you really can make that dream come true! Morocco is not much larger than California and is located across the Strait of Gibraltar on the Mediterranean. This beautiful country looks out on the Atlantic from northwest Africa. The country was inhabited and controlled by a variety of cultures in the past, including Arabs, Spanish, and French. It's no wonder then that the designs which are associated with Morocco are rich in color and texture. Today, homeowners who crave drama often turn to Moroccan influences, many not even knowing that the designs they use are inspired by this country. Moroccan bedroom designs are easily recreated with paint, fabric, and a few accessories. Even if your budget won't allow you to give your bedroom a complete overhaul with new furniture as well as other decorating accessories, you can achieve the look you want. It's easy to get carried away when it comes to color. Moroccan colors can range from brilliant blues to ruby reds or saffron yellows, but there are usually hints of sand and earth tones scattered about as well. When you use such powerful colors, you can often end up losing a room's true design. The colors are so rich, that they often overpower the room, so it makes sense to play up one or two rich colors, and use the rest of the colors as accents. How do you choose a color? If you are completely lost, it's always best to work from an item you already have. Go ahead and look for a bedding set or a simple accessory, like a lampshade or a throw pillow. Pull your primary color, and even your accent colors, from these pieces. For example, if you want your bedroom walls to recreate your own passionate personality and add romance to your room, then you might want to paint them a gorgeous red. Splashes of other jewel tones, such as blues and greens, could be echoed in the throw pillows, curtains, and other accessories. To tone down a room that is awash in color, consider adding accents in a sand or other earth tone. For inspiration when it comes to bedding, search online or in a local bath and bedding store. Look for materials that is made of silk or silk blends, satin, or even a shiny polyester blend. Embroidered silks on pillows and throws look wonderful in Moroccan bedroom designs. You may be able to find unique items at online auctions like eBay as well. Bedroom sets may include the pillow shams, dust ruffle, and even throw pillows and curtains. If you don't get everything you need in the set, choose an accent color from the set, and search for material to make your own curtains and extra throw pillows. Using accessories in Moroccan bedroom designs is easy. While of course, you can look for more expensive pieces, such as heavy iron wall hangings and tables or ornate wooden pieces, you can also use less expensive items. Mosquito netting or canopies can be used to envelope your bed. Add brass accents, such as candle holders with beautifully colored candles to match your other accessories. Place a room divider or screen in the corner of your bedroom. Find beautiful lanterns that hang from the ceiling or sit on a night table. Create a cozy reading corner with an armchair draped in silky material, an embroidered pillow, and a low-lit lamp or lantern nearby. 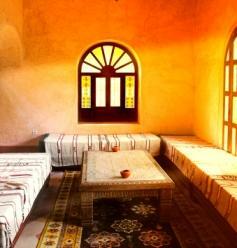 Finally, for more Moroccan design ideas, visit the following sites.